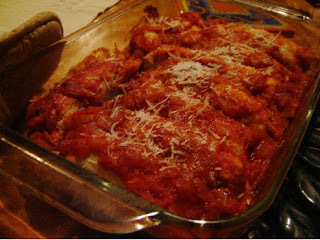 One of my all time, favorite Italian dishes is Cannelloni, filled in a variety of ways, and topped with an appropriate complement for whatever the filling happens to be. This past Sunday we had roast chicken, so a stuffing of chicken and some cheese was a great way to use the left-overs. Also, using the extra crepes from Sunday's breakfast made it an even more obvious choice. Though, I must admit, it was one of the reasons I did make those crepes. My very favorite breakfast, fruit-filled crepes. Yes! If using cold crepes, put them on a plate, with a bit of waxed paper on top, and nuke for less than half a minute, just enough to warm them up a bit. Next fill with chopped, cooked chicken, mixed with some cream cheese or sour cream, and a little shredded cheese or ricotta. Then top it all with your marinara sauce. Bake about 15 minutes and that's it. There as many versions of this famous dish, as I'm sure there are of its namesake, those ladies of the night. What's a girl to do? When the days are hot, the evenings still warm in the kitchen, and nothing in particular grabs your culinary attention? You need something with zip and flavor to get you out of the humdrums. Our solution is to start opening cupboards and fridge, pulling out those staples, hopefully present for times such as this. Things you love and shouldn't be without; Parmigiano Reggiano, anchovies, olives, capers, garlic, red pepper flakes, tomatoes (canned or fresh) and pasta. Then, you add a bit of something to make it your own. Substitutions are allowed. Free expression and all that. 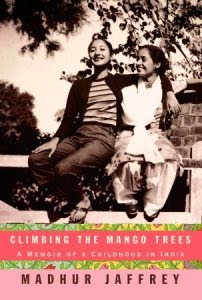 For our current Cook the Books Club selection we had a delightful pick, Climbing the Mango Trees, Memoir of a Childhood in India, by renowned cookbook author, Madhur Jaffrey. I must say, if asked to pick among all the cuisines of the world, my very favorite would have to be the varied and complex cooking of India. And, in addition to reminiscences of her growing up years, Madhur Jaffrey has kindly included a number of her favorite family recipes. Her account gives us glimpses into important historic events of her time, such as the Colonial years, the fight for independence, war years, and the assassination of Ghandi, as seen through the eyes of a young girl born into an affluent Delhi family. What more could you want in a good book? Recipes, family drama in a far off place, written in an entertaining style, with a bit of colorful history thrown in for good measure. Some of my very best travel experiences involved Indian cooking, in Indonesia and Singapore especially, where I remember some awesome vegetarian curries served on banana leaves. I wanted to do that. Though, often I feel somewhat at a disadvantage whenever even considering cooking Indian food. I would love to go to an intensive cooking school, perhaps run by Jaffrey? That is one of the disadvantages of living out in the middle of the Pacific Ocean. You can't pop across town to attend classes offered by a famous chef. It is just not happening here. I had a good friend, Devi, who has long since moved to California. The best cook ever, I remember wonderful meals in her home. She taught a class once at our Community College. One day only. One dish. Oh well. So, not knowing where to begin for inspiration from the book, (I'd like to try everything) I figured a good choice might be one of Jaffrey's family favorites, Meatballs (Koftas) in Curry, for which she includes her recipe on page 250, and a Potato Raita. With perhaps cucumber and shredded greens in yogurt as a side dish, along the lines of a traditional Sunday family meal she recalls on page 196. A really delicious version of the traditional (if you're American) Mac 'N Cheese. This includes a sprinkling in between layers of sliced fresh basil, and bits of chopped, smoked salmon in the center. I made a white sauce using buttermilk and some sour cream, and the cheese was a medium cheddar and Parmesan. Toasted, buttered breadcrumbs on top. Oh boy. True comfort food. Neither of us are gluten intolerant, but just for easier digestion, I've been cutting down on our intake, whenever it's easy enough, as with this "gluten free" Quinoa Macaroni. Taste wise, it is indistinguishable from the other, at least to me. Maybe not to the refined buds of a professional taste tester. Also, and on a side note, I am learning (it's taken long enough) to carefully do a mise en place for my meals. Sometimes, just winging it turns out to be really a hot, sweaty, tiring operation. Taking the extra time, starting early enough, and laying everything out nicely, makes cooking so much more enjoyable. I say this in admission of what was not done for this particular dish. Leaping into action at the last possible moment, throwing things together, hot, bothered, and snapping at my poor husband, who had the luck to arrive at just that point. I had thought one of our grandkids would be coming along with him, which was the inspiration behind this, one of their favorite meals. Okay, mine too, and Bob's. I watched Mark Bittman do this and thought it would be the perfect dinner, using up some left-over chicken and most of my remaining CSA vegetables. It was a bit more colorful than this photo shows. The carrot seems to be hiding. 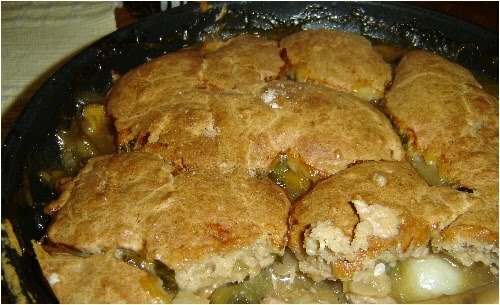 Anyway, my variation was to put the cobbler topping on the vegetables, right in the oven-proof pan they were cooked in, then pop it into the oven. I love one pot cooking. First simmer your chopped vegetables in chicken broth and perhaps some white wine, a few herbs. Season to taste. Bittman used rosemary. I used squash, green beans, a small leek, a few mushrooms and carrots. If your chicken is uncooked, of course cook it along with the vegetables, otherwise add at the end. When everything is nearly tender, add some of the reserved broth or wine, with 2 tablespoons cornstarch blended in, to thicken. I added chopped basil just before topping with the cobbler dough. Which you can prepare while the filling is simmering. Preheat oven to 400 F.
Whir together in a food processor or mix in a bowl, cutting in the butter. Plop clumps of dough onto the top of your chicken and vegetables, and pop the pan into a preheated oven for about 40 minutes. Serve with a good white wine. Much easier than Chicken Pot Pie. No rolling out of pie crusts is involved here. Thanks Mark Bittman, good idea. Little Mini Pizza rounds are great for a quick delicious lunch. They come in packages of 3-6, very handy to keep in your freezer. They can be gluten free too. Use what you have on hand for toppings. I spread on an olive Tapenade, then some sliced marinated paprika peppers, and cheese, baked it, then added the slices of avocado and arugula leaves after it came out of the oven. A drizzle of olive oil, and there you have it. Bake at 400 F for about 15 minutes on a pizza rack. Remove and add your extra toppings. What could be simpler, and a nice alternative to sandwiches. I love pizza. Sometimes, if it's for dinner, I'll make Mark Bitman's easy flat bread crust with some of my sourdough starter. Make it a bit thinner and turn out onto the pizza rack for a final bake with toppings. This soup, served cold or hot is a favorite of mine. Especially when you have a really good pumpkin to begin with. Bob found it lost in the weeds on a property he was inspecting. It was so gnarly looking on the outside that I neglected to take a picture of the poor thing, supposing it would be too old once opened up. But not at all, the color was vibrant and the taste intense and delicious. Since the boy was also quite big, we had lots left after a simple dish of steamed pumpkin with butter and feta. So, soup was next in line. Now, I have to remember what all I added to this version of an old stand-by. I started out by sauteing some curry leaves in ghee, which were removed when crispy and set aside on a paper towel. An onion, was fried in a bit more of the ghee until soft, then minced ginger and some chili pepper was added, and cooked for a few minutes more before the dry spices went in.